Mazda has previewed technology and direction for its future cars in the RX-Vision concept revealed at the 44th Tokyo Motor Show. The car is rear-wheel drive and is powered by the next-generation Skyactive-R rotary engine that operates through the rotational motion of triangular rotors - as opposed to reciprocating pistons in regular engines. Mazda is the only company to mass-produce cars with a rotary engine. The first car that commercialised this engine was the Mazda Cosmo Sport 110S in 1967. The practicality of rotary engines for automobiles has been debatable - with power output losses due to air resistance caused by the spinning engine and problems in stability and control owing to the torque-induced precession. But with efforts put in to improve the power output, fuel efficiency and durability of the engine, Mazda went on to take overall victory at the 1991 Le Man with a car that was powered by a rotary engine. Masamichi Kogai, Mazda's representative director, president and CEO, said, "I look forward to talking with you more about this vision we have revealed here today at the Mazda stand. Mazda will continue to take on new challenges in an effort to build a special bond with our customers and become their 'one and only' brand." We're at the 44th Tokyo Motor Show and will be reporting from the Tokyo Big Sight all day long. Bookmark OVERDRIVE's 2015 Tokyo Motor Show page to stay updated. Mazda RX-VISION features next-generation SKYACTIV-R rotary engine Company sees new potential in a powerplant that is synonymous with the brand Tokyo / Leverkusen, 28 October 2015. 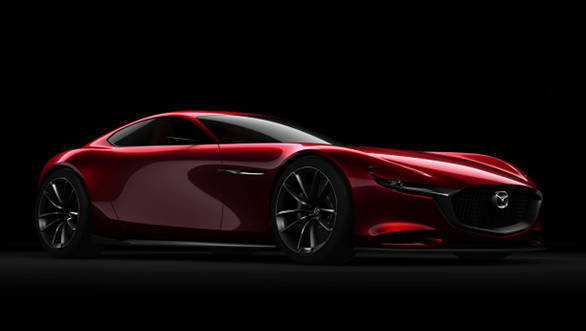 Mazda Motor Corporation unveiled the Mazda RX-VISION today at the Tokyo Motor Show. 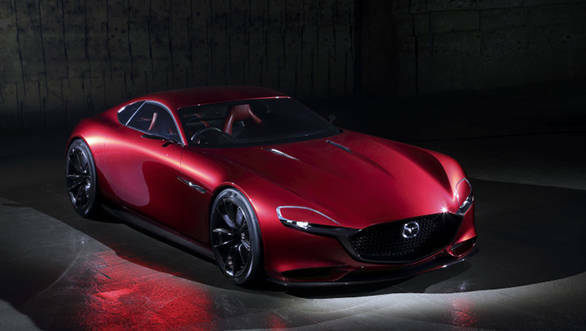 The sports car concept is powered by a next-generation SKYACTIV-R rotary engine, the unconventional technology that is perhaps the most compelling symbol of the carmaker's challenger spirit. Mazda RX-VISION (Reference Exhibit) An exquisitely proportioned front-engine, rear-wheel drive model, the RX-VISION represents a "vision" of the future that could only come from Mazda. And one that countless fans of the brand around the world hope will become a reality. Rotary engines are unique in that they generate power through the rotational motion of triangular rotors (unlike the reciprocating pistons in conventional automotive engines). Overcoming numerous technical difficulties, Mazda succeeded in commercialising rotary power, first in the Mazda Cosmo Sport 110S in 1967 and then in several other models. The most successful of these was the Mazda RX-7, the most-sold rotary car ever with more than 800,000 produced between 1978 and 2002. Continually striving to improve output, fuel economy and durability, Mazda was the only company to ever win the 24 Hours of Le Mans with a rotary-powered race car, a feat it managed in 1991 in the Mazda 787B. Although not currently mass-producing any rotary models, Mazda never ceased its R&D activities. The carmaker chose the SKYACTIV-R label for the next-generation rotary engine to express its determination to continue delivering its customers convention-defying technology and an uncompromising SKYACTIV experience behind the wheel. "I look forward to talking with you more about this vision we revealed here today at the Mazda stand," said Mazda's Representative Director, President and CEO Masamichi Kogai. "Mazda will continue to take on new challenges in an effort to build a special bond with our customers and become their one and only brand." The Tokyo Motor Show opens to the public from 30 October to 8 November."